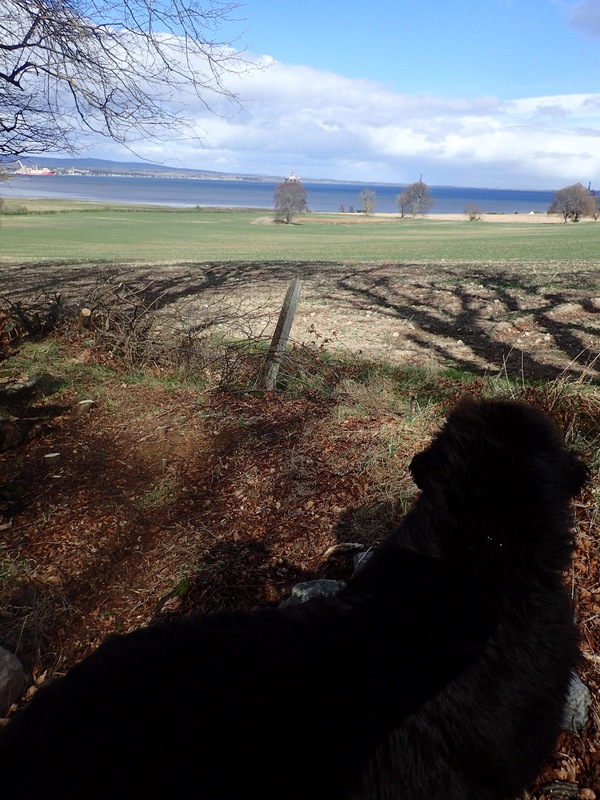 A not-so distant bark announces both the dawn and the passage of a morning delivery truck which speeds along the narrow Scottish road on the other side of the thick hedge that isolates our safe haven of dog love from the rest of the world. 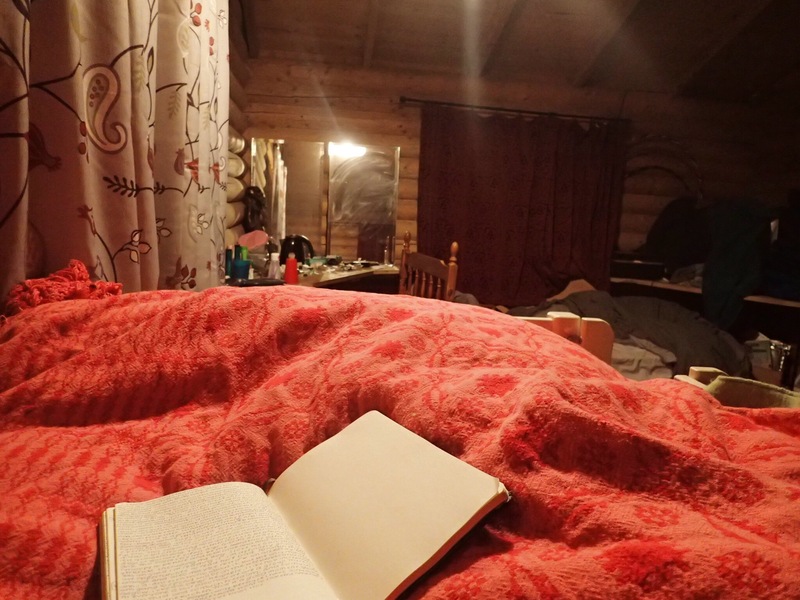 I attempt a last-minute burrow between the piles upon piles of thick wooly blankets, ignited by my body temperature and protecting me against the chilly Scottish morning air in the wood cabin, but am unsuccessful. A huge, wet black nose tickles its way underneath the first layer of blanket and sniffs at my yawning face. Flo shoves a big paw under the covers and gives me a grand lick as I counter with my forearm. She takes this as encouragement; the other paw jets under the covers to join it’s twin, and Flo’s entire torso flops upon my body. 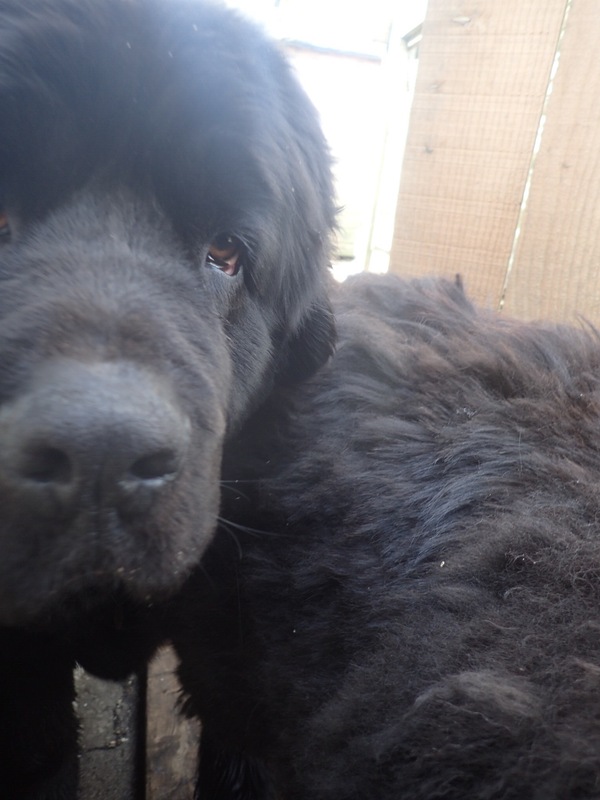 Newfoundland’s like to snuggle. They like to be held. And by this I mean they like to hold you and perhaps pretend that the sizes are switched and you are holding them. But all three of us know the real story. They drap their black fuzzy masses upon you in all of their glory, enveloping your face in pounds of thick wooly fur. You anatomically can’t help but bury yourself into the folds upon folds of warm slobbery goodness that is the Newfoundland. I fall asleep to Flo’s guttural snores and wake up to her massive head wanting nothing but love. I subcome immediately to this, of course, and saunter out from under my beautiful warm covers. Hopping on one foot to decrease Josie-to-cold-cabin-floor ratio as much as possible, I yank on one black rubber Hunter wellie after another and give Flo a squeeze. Together we exit the little cabin and head for the main cottage. The first thing we do–the three other volunteers and I–is wake the Newfies up and give them breakfast. This one-course meal is offered in two options: for the younger Newfs we have a delectable full-scoop of small diamond-shaped dog food served alongside a hearty half-scoop of big pillow-shaped Newf food, and topped with the finest white laquered vitamin pill and a big ol’ hug for good measure. 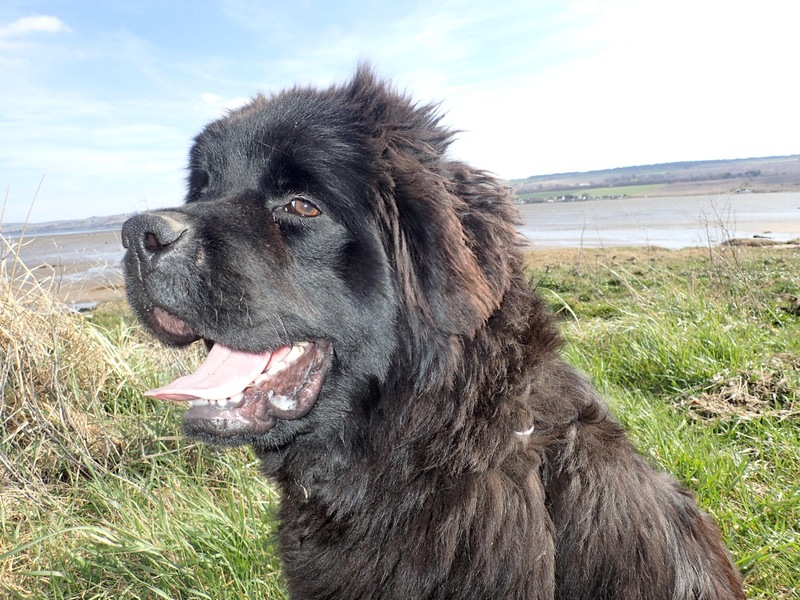 For our larger, more furry Newfs, we’ve got a more sophisticated palate: one and a half scoops of Scotland’s finest big Newf chow slow roasted and finished with a squeeze of absolutely appetizing “Dog Chub”. Friends, it’s as good as it sounds. I would know, because Ishka and Monty like to play “who can spill all the dog food better” pretty much every morning, and I get to be the fortunate official who picks up each piece by hand because I’m too lazy to go grab the broom from the kitchen. So ergo my hands smell like “Dog Chub” for a significant portion of the day. After Newfie breakfast comes the human breakfast. Cups of Scottish tea, coffee, and orange juice accompany buttered toast with jam and honey. Sometimes my American side comes out and I slather peanut butter on my toast instead of butter. And by “sometimes” of course I mean every morning. Our volunteer task force consists of a fabulous French poet-photographer duo and a boxing Spaniard from Barcelona. Together, under the trusting guidance of the very curly-haired, very Scottish Liath, we pull of the seemingly impossible; attending to the needs and requirements of 15 absolutely full-sized Newfoundlands. After washing and drying the breakfast dishes, we assume our pooper-scooper places and clean the garden and the kennels. Then we take hoses and attack the floor of the kennels. The later task is easier said than done: Vladimir and Daisy have this wonderful fascination with the hose, and dancing around trying to purge the concrete slabs of the furry remains of a Newfoundland’s good night sleep is turned into quite the water park as the freezing Scottish hose water reverberates off the massive flat heads of Vlado and Daisy. Breakfast: done. Newfie droppings: scooped and deposited (hint: don’t drink the creek water). Kennels: shining. From here we split. Some begin grooming or trimming. Some begin with repairs. Some tackle household duties. It might be hard to imagine, but with so many massive dog-bears lumbering around sleepily, things get a bit dusty. 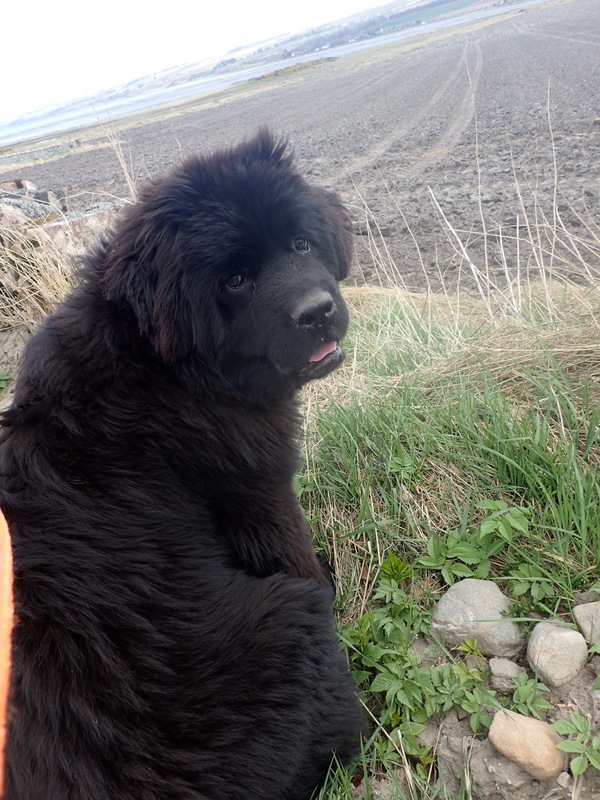 We have 3 weeks off from Austrian Uni for Easter Break, and to maximize the wonderfulness of so much holiday time, I’ve popped over to the Scottish highlands to learn how to train and take care of Newfoundlands. 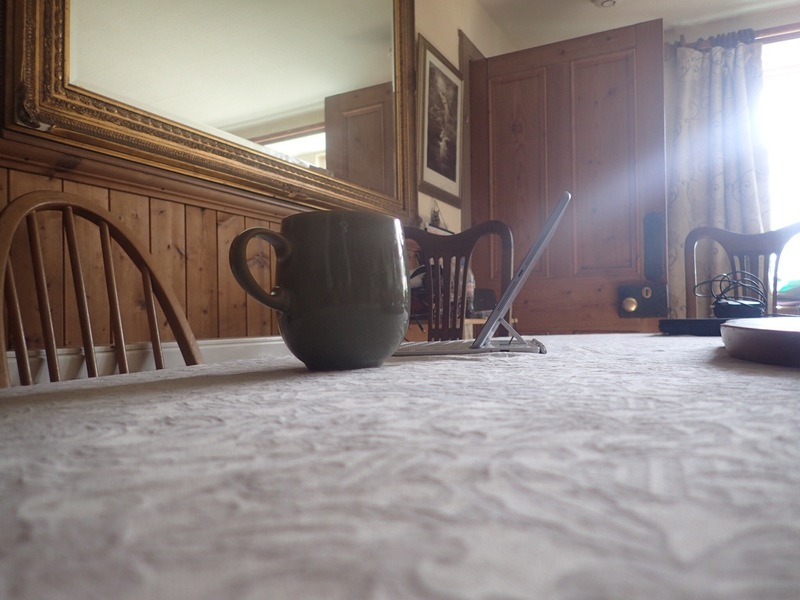 The 25 hours a week of work is exchanged for the most diverse, vegetable-loving kitchen to be entirely at my disposal and a blanket-shrouded bed in a woodsy cabin. It’s ideal, to put it lightly. I’ve got a lot of favorite moments. But a repeated favorite is when Monty sprawls in all of his massive glory right in front of the front door and positively disables the oppertunity for the door to swing open because his solid furry head is propped up against it. In order to jettison out of the house, one must firmly grasp the door handle and do everything but brace two legs against the wall to yank it open. Monty’s thick furry body slowly, very slowly slides backwards along the wooden floor as the door becomes more accessible. He literally doesn’t wake up for this. I don’t even know if he can feel it, he’s that Newfoundland. You can’t hurt a Newfie. You accidentally trod on their paw? There’s about fifteen layers of skin between your foot and their nerve endings, they don’t even notice. You want to take a nap on top of Ruby? Go ahead. Flop yourself down. Besides a palpable “I’m so glad you’re with me!”, there’s almost no response. I mean, it’s not an issued challenge, but just know they’re an insatiably durable breed. Not only can you not hurt them, but they would never ever hurt you. They may look powerful and foreboding, but not an ounce of aggression or meanness resides in those massive black bodies. There’s too much love, empathy, and snuggles to leave room for that. 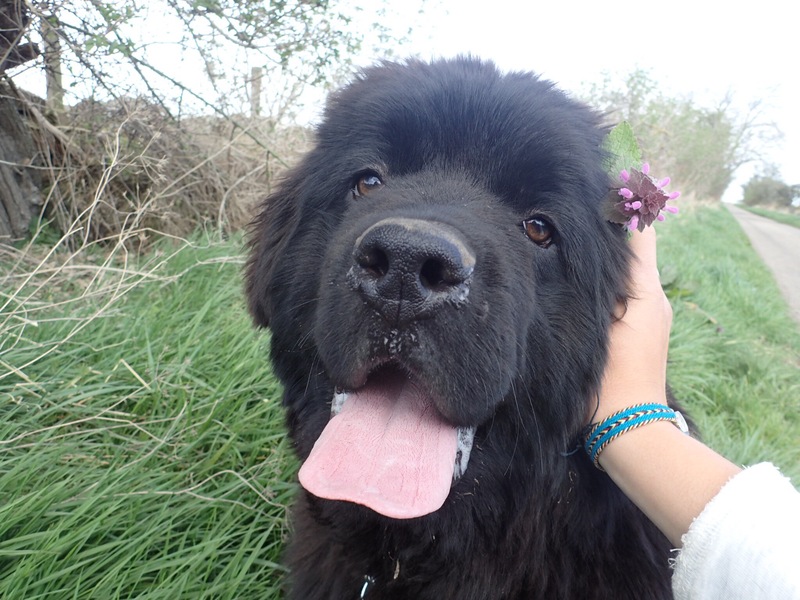 Newfoundlands are cute. Like, real real cute. Like, they’ve got so much skin on their face that when you stroke them they assume different facial expressions. 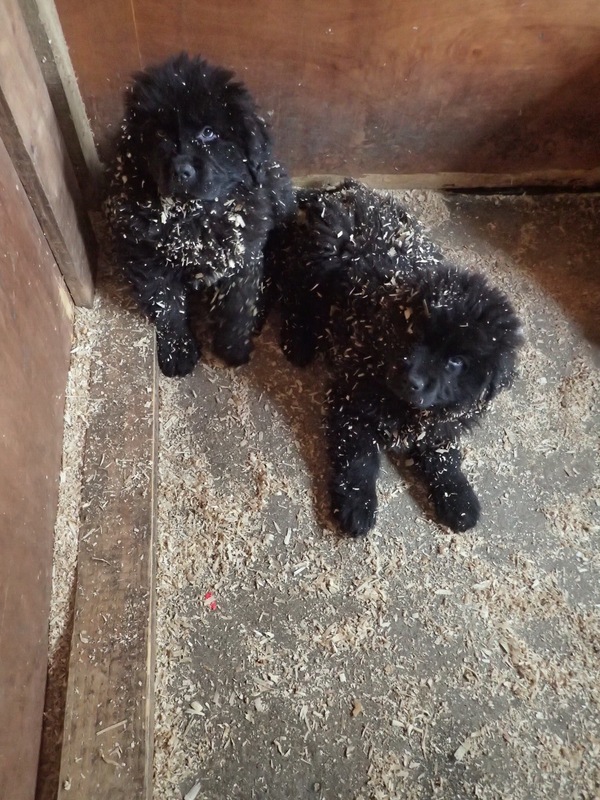 If the full-sized Newfies are delectable and perfect…can you…can you even imagine–my heart thuds to a stop every time I merely think of them–the Newfie puppies? Proof that there is a God, friends. 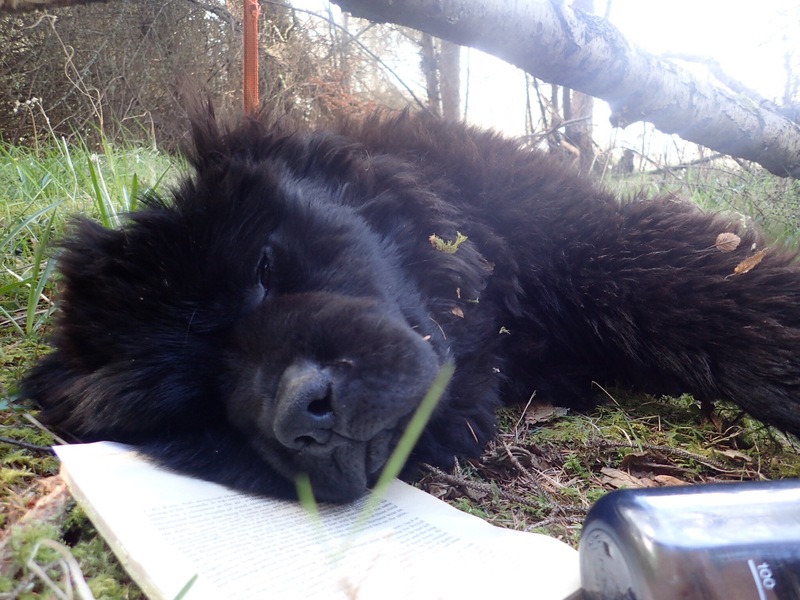 Stay tuned for a blog post solely devoted to attempting to portray an accurate description of the Newf pups. They’re that……oh, you’ll read about them. That’s all for the morning report, loves.